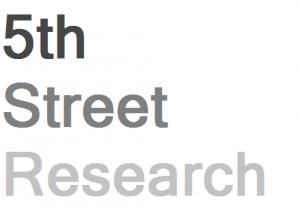 Founded in 2013, 5th Street Research is an independent provider of investment analysis and equity research. We strive to provider unbiased, clear and concise information, highlighting companies that either present significant value or carry a high level of risk at their current valuation. Over the next few days we will be publishing our first reports here, starting with an analysis of Melco Crown Entertainment (MPEL) a resort/ casino operator with a strong presence in Macau. Be sure to follow us on Twitter @5thStResearch.